How are you adjusting to daylight saving? 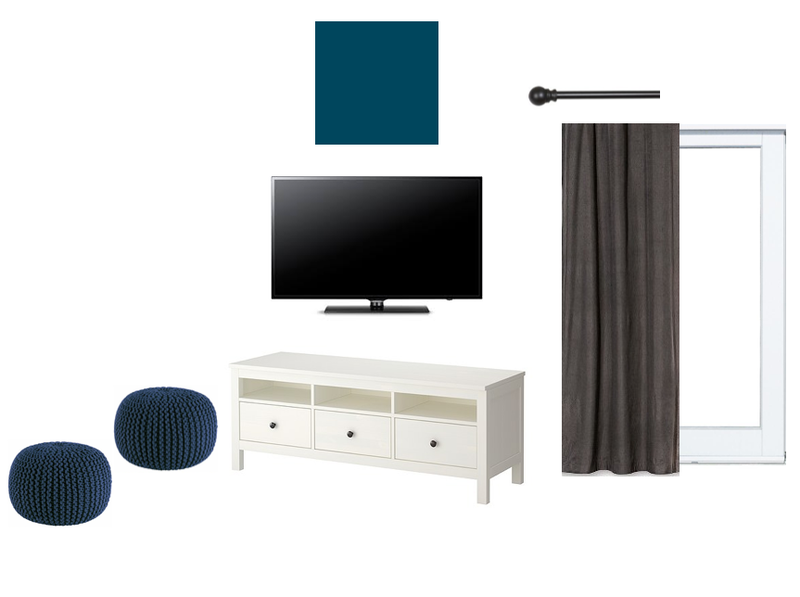 Today I am showing you the next concept design for our Family Room. This will be for the wall to the right of our previous design. On this wall we have our TV stand and TV. I love how the white pops against the blue paint. I originally wanted to have the matching book cases on either side but felt that it would make the room feel too crowded. I decided to add these poufs in the corner instead. They can be used as decoration and are easy to grab when you need some extra seating. Since this wall is pretty plain I added the sliding glass door which is located to the right of this wall, or parallel to the picture ledge wall. We choose dark gray drapes to match our couches. These particular drapes are black out so they are extra good at keeping the sun out during the day. The drapes are hung on a black curtain rod to match the knobs on our TV stand and the black hardware on our coffee table. Since we didn't use the book cases like we originally planned we don't have as much storage space. Any suggestions on how to add storage but not lose space?